2018 Reissue / Repress on Black Vinyl in Gatefold Sleeve. 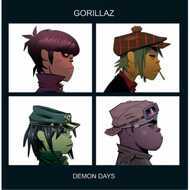 Demon Days is the second studio album by Gorillaz. The album features the hit singles "Feel Good Inc.", "DARE", "Kids With Guns", and "El Mañana", with contributions from De La Soul, Neneh Cherry, Martina Topley-Bird, Roots Manuva, MF DOOM, Ike Turner, Bootie Brown of the Pharcyde, Shaun Ryder, Dennis Hopper, the London Community Gospel Choir, and the Children's Choir of San Fernandez.